Yesterday, July 26, 2009, Major League Baseball enshrined three former players into the Cooperstown Baseball Hall of Fame. Those three players are the late Joe Gordon, Jim Rice, and Rickey Henderson. When I grow older and talk younger kids about baseball, whether they happen to be my own or not, Rickey Henderson is sure to be mentioned. I was born in 1981, two years after Rickey Henderson made his Major League Debut with the Oakand A's. I will never forget all the wonderful games I saw in Oakland and on TV where Rickey Henderson stole the show. He had a swagger about him and while some might think he was full of himself, there simply was nobody better at doing what he did than Rickey Henderson. When Rickey Henderson reached first bases whether by base hit or walk, everyone in the ballpark knew the pitcher was in for a tough time. 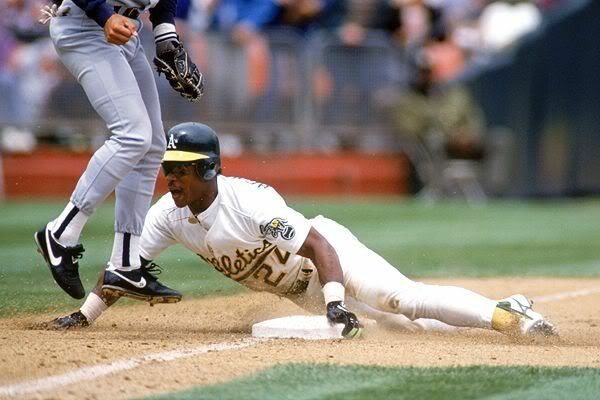 Rickey would dance off the first base bag, hands dangling low near the dirt, relaxed...and once he got a read off the pitcher, Rickey was off for 2nd base. Eventually, Rickey Henderson earned the nickname, "Man of Steal." I will never forget the day when I got to meet Rickey for a brief moment at an Oakland A's event at Jack London Square. I got his autograph and shook his hand. One thing that was absolutely genuine about Rickey is that he cares about the fans. He knows that without the fans support he would not be where he is today. Rickey showed time after time how grateful he was. He loves the game of baseball, played for 25 years, and still wants to play today if someone would let him. He played for 9 Major League teams in his career, but enters the Hall of Fame wearing an A's cap, the team that drafted him and the team where he spent most of his career. On Saturday, August 1st, Rickey Henderson will have his jersey number retired in Oakland, and I will be there to see it. From 1979 to 1984 with the Oakland A's: Rickey Henderson stole 100 bases in 1980, a record 130 bases in 1982, and 108 bases in 1983. He drew 117 walks in 1980, 116 walks in 1982, and 103 walks in 1983. He was an All-Star in 1980, 1981,1982, 1983, and 1984. He won the Gold Glove Award in 1981 and also the Silver Slugger Award the same year. 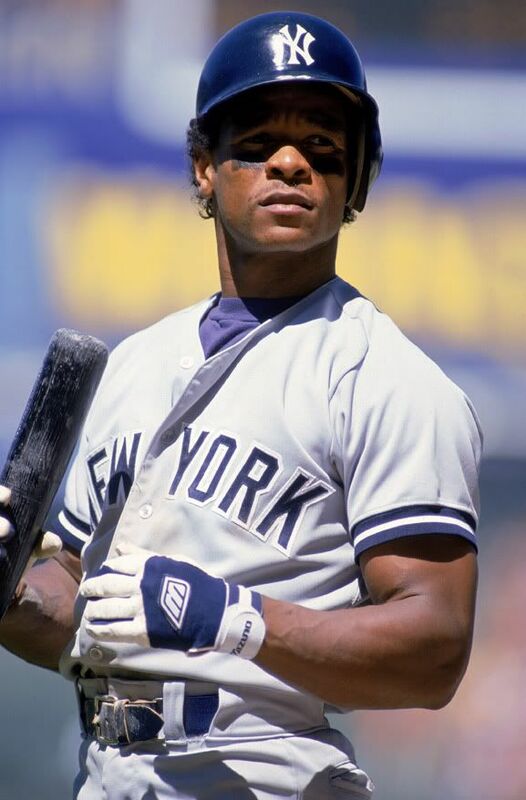 From 1985 - Mid 1989 with the New York Yankees: Rickey Henderson scored 146 runs in 1985 and scored 130 runs in 1986. He stole 80 bases in 1985, stole 87 bases in 1986, and stole 93 bases in 1988. He was an All-Star in 1985, 1986, 1987, and 1988. From mid-1989 - mid-1993 with the Oakland A's: The Oakland A's won the World Series in 1989 in large part due to the return of Rickey Henderson. 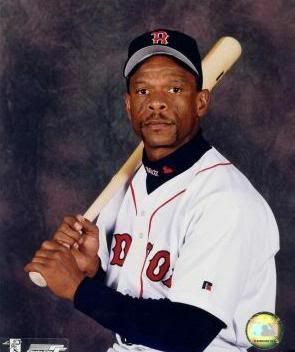 Rickey Henderson then went on to win the American League Most Valuable Player Award in 1990. He also won a Silver Slugger Award in 1990. He was named an All-Star in 1990 and 1991. In 1990, the year the A's were favorite to win the World Series again but got swept by the Cincinnati Reds (I was at game 4), Rickey batted .325, scored 119 times, and hit 28 home runs. Mid 1993 to the end of season with the Toronto Blue Jays: Rickey spent 44 games with the the Blue Jays after a trade sent Rickey to Toronto. In those 44 games, Rickey Henderson stole 22 bases. The Blue Jays would go on to win the World Series in 1993. From 1994-1995 with the Oakland A's: Rickey again returned to his hometown with the Oakland A's. He stole 22 bases in 1994 and 32 more in 1995. These were down years for the A's, but Rickey continued to play the way only Rickey knew how. 1996 to mid-1997 with the San Diego Padres: In 148 games in 1996, Rickey Henderson scored 110 runs and had 38 Stolen Bases. He also walked 125 times. Oh yeah, he did all of this at the age of 37. In his 88 games with the Padres in 1997, Rickey stole 29 bases. In 1998 with the Oakland A's: At age 39, with his final stint with the Oakland A's, Rickey proved he still had plenty to offer. He drew 118 walks and led the league with 66 stolen bases. He also scored 101 runs. From 1999-Mid 2000 with the New York Mets: In 152 total games with the Mets, Rickey compiled 107 walks, 42 stolen bases, and had 105 runs. 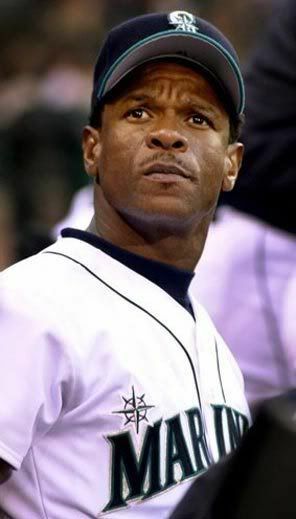 In 2000 with the Seattle Mariners: After just 31 games with the Mets in 2000, Rickey came over to the Mariners to play the remainder of the season. In 92 games, Rickey had 63 walks and 31 stolen bases. 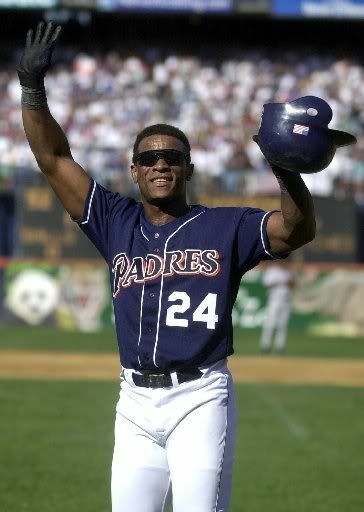 In 2001 with the San Diego Padres: Rickey Henderson returned to San Diego for his second stint and while he was there he set the career record for runs scored. 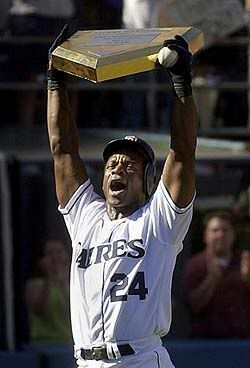 (hence the photo of him holding up the home plate plaque) In 123 games with the Padres, Rickey drew 81 walks, had 25 stolen bases, and scored 70 runs. His last hit of the season, would be his 3,000th in his career. In 2002 with the Boston Red Sox: At age 43 in 72 games, Rickey had 38 walks, 8 stolen bases, and most impressive to me, 40 runs. That is 40 runs scored with just 40 hits all season. It shows you again the many ways Rickey was able to produce runs. 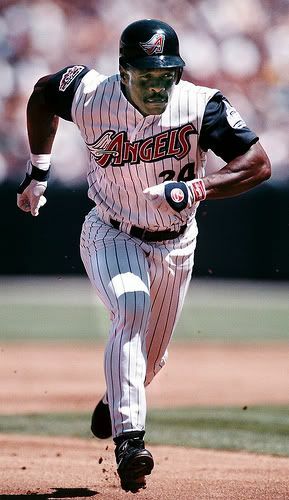 After the 2002 season, Rickey Henderson was a free agent. In 2003, He was 44 years old now and nobody showed any interest in signing him to a deal. Rickey felt like he could still play though. Rickey ended up signing with an Independent Minor League team, The Newark Bears. Newark loved Rickey Henderson as he helped boost their attendance. Here people could watch a future Hall of Famer for less money than the Major League price. In 56 games in 2003, Rickey had a .339 Batting Average. In 2003 with the Los Angeles Dodgers: The Dodgers took notice of Rickey Henderson's play in his 56 games with Newark so they signed him to a deal. 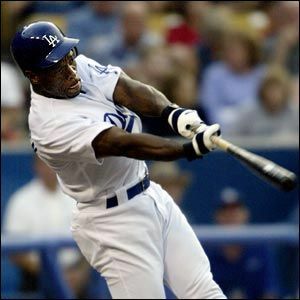 Rickey joined the Dodgers, in need of offensive help, and served mainly as a reserve player. 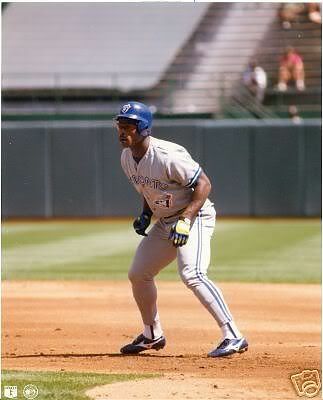 In 30 games with the Dodgers, Rickey had 11 walks, 15 hits, 3 stolen bases, and hit 2 home runs. The Dodgers would be his 9th Major League team in 25 seasons. 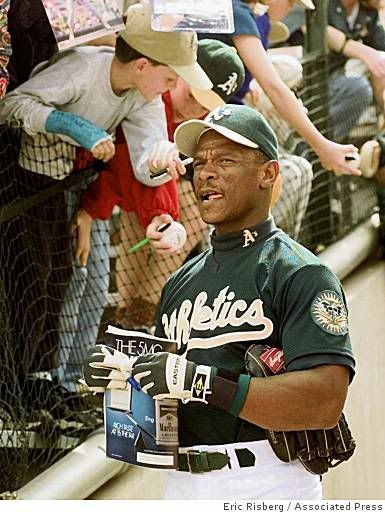 In 2004 - Rickey Henderson was a free agent again and again no team signed him. 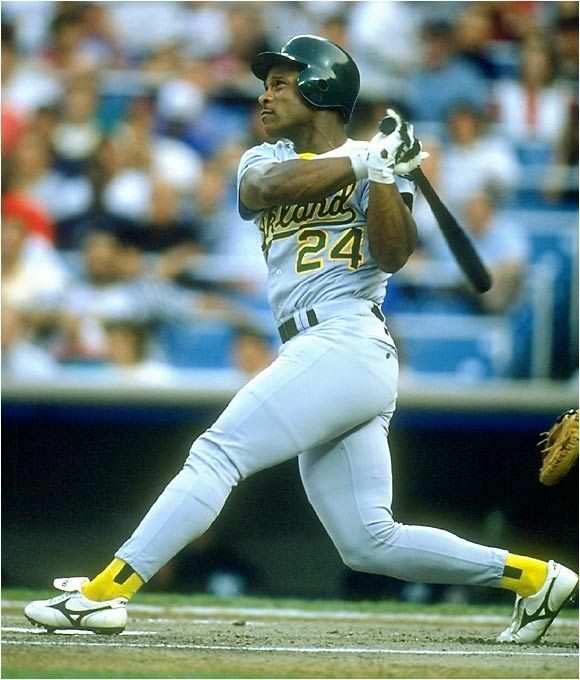 Rickey expressed his interest in coming back to the Oakland A's, but Billy Beane was not interested, even if it was to just play one game and retire as an Oakland Athletic. So Rickey decided to rejoin the Newark Bears in 2004 and play some more. And play he did. 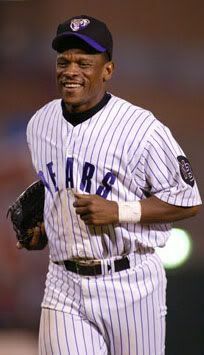 In 91 games in 2004 with the Bears, Rickey drew 96 walks, stole 37 bases, and scored 70 times. Yet no Major League team signed him. 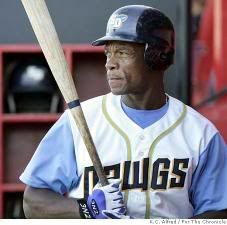 In 2005 with the San Diego Surf Dawgs: At age 46 and still unsigned by a Major League team, Rickey joined the recently formed independent Golden Baseball League as a member of the San Diego Surf Dawgs. In 73 games, he drew 73 walks and stole 16 bases, scoring 52 runs. After 2005, Rickey, still wanting to play, realized that his playing days appeared to have come to an end. He had showed people that he could still play the game of baseball and loved the game of baseball, but younger players were now getting the call for most teams. It was time for Rickey to let the next generation of ballplayers have their turn. 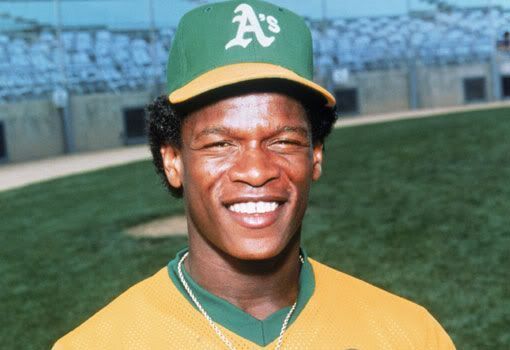 In his 25 season Major League Career, Rickey Henderson played in 3,081 games, obtained a record 2,295 runs scored, amassed 3,055 hits, 510 doubles, 297 home runs (including a record 81 home runs to start a game), a record 1,406 stolen bases, and a record 2,190 unintentional walks. 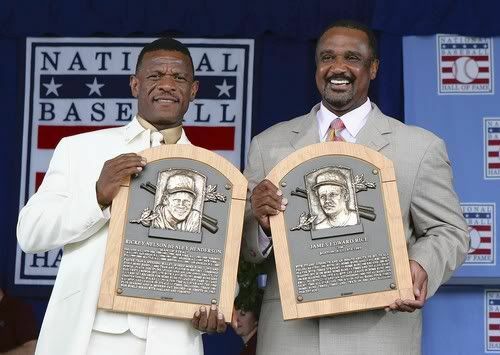 Yesterday, Rickey Henderson (with Jim Rice on the right) joined the Cooperstown Hall of Fame. 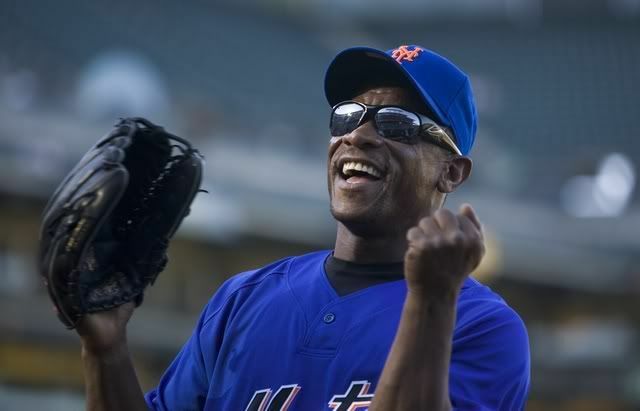 Congratulations Rickey Henderson. Your career showed what it means to have hope, love, fun, and never take anything for granted. good article, rickey is and will always be the best base stealer to ever play the game of baseball. he loved the sport and it was evident, i never really liked the A's but I always liked Rickey!